Everyone loves a good scare on Halloween, but not when it comes to child safety! Check out these tips for a Safe & Happy Halloween Night. Here’s a scary statistic: Children are more than twice as likely to be hit by a car and killed on Halloween than on any other day of the year. In 2017, October ranked No. 2 in motor vehicle deaths by month, with 3,700. July is No. 1, with 3,830 deaths. 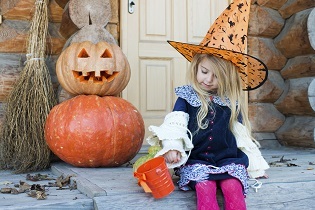 To help ensure adults and children have a safe holiday, the American Academy of Pediatrics has compiled a list ofHalloween safety tips. Before Halloween arrives, be sure to choose a costume that won’t cause safety hazards.